May the light of your Cross, O Lord, shed light and meaning on all crosses! 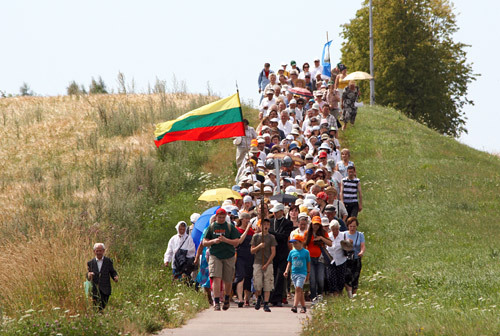 The first accounts of Lithuanian pilgrims and of pilgrimages in the Grand Duchy of Lithuania (GDL) go back to the 15th century. At that time, travel from Lithuania to world-famous places of pilgrimage was rare, limited as a rule to the occasional journey of clerics or aristocrats. The most common destination was Rome, perhaps with a stop in Loreto. The first Lithuanian pilgrim to the Holy Land was Aleksandras Soltanas, a GDL treasurer who visited Jerusalem in 1468. Mikalojus Kristupas Radvila the Orphan wrote about his pilgrimage to the Holy Land in 1582-1584. His concise yet vivid book, called “A Trip to Jerusalem”, made popular reading in the late 16th and early 17th centuries. But most Lithuanian Catholics in GDL times settled for pilgrimages to prominent local shrines. After all, the realm was relatively sparsely populated, and the roads quite poor. Unlike in Western Europe, in the GDL it was not relics of martyrs and other saints that most attracted pilgrims, but rather miraculous images – especially paintings of the Blessed Virgin Mary. The influence of devotion to icons among Eastern Christians no doubt played a role here, as did a steady growth of Marian piety in this part of the world, particularly during and after the Reformation.